(From left) Victoria Lara, Christina Romero, Kathya Moreno. The nurses who waited excitedly to officially earn Bachelor of Science in Nursing degrees on Saturday had traveled varying distances and from many walks of life. 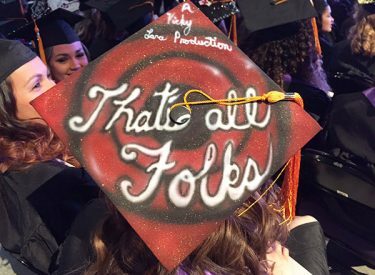 Nurses love to decorate their mortar boards. One thing many had in common: They were grateful for the opportunity to work full time as nurses while living life and earning their BSNs online. “It was great for me,” said Ashley Aposhian of Mesa, who works at a health and rehabilitation center. She had previously earned an associate’s degree in nursing, but she needed the higher degree under her belt to maximize her options. “All the hospitals want you to have your bachelor’s degrees,” she said. For Aposhian, the best part of studying online is her 15-month-old son. Her life would have been too complex and busy to attend school as a ground student. “It was absolutely right for me,” she said of GCU’s popular program. For Tina Okoye of Dallas, the idea of earning a bachelor’s degree online was a bit daunting. But her GCU adviser helped smooth her path. 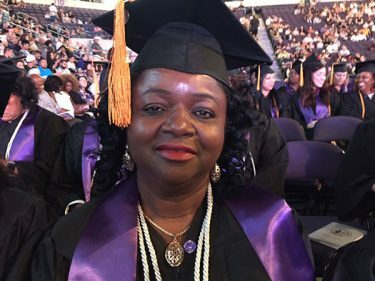 Okoye, who also has her associate’s degree and works on the medical surgical floor of a Dallas hospital, said her nursing has improved significantly since she began studying at GCU. She feels more adept at “evidence-based” practice, she said. 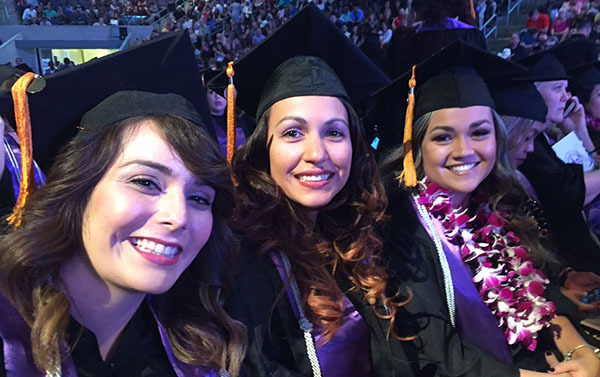 Three high school buddies who all became nurses and then went on together to earn their online BSNs had the joy of graduating together. “We were all friends at Douglas High School,” said Christina Romero, referring to Kathya Moreno and Victoria Lara. After graduating from high school, they all earned associate degrees in nursing at Cochise Community College and went on to find nursing jobs in three different municipalities: Tucson, Bisbee and Douglas. So Saturday was a bit of a reunion, and for this trio, a third time graduating together.